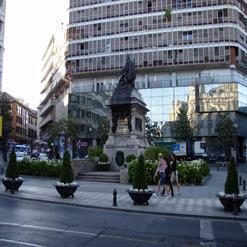 Plaza de Bib-Rambla is a pleasant square with a view of the cathedral's tower. This plaza was originally the center of Moorish Granada, a bustling focus point of markets and festivals. Today the square is a quiet place to relax, enjoy a coffee or a meal, or take in the colorful flowers and bubbling fountain.